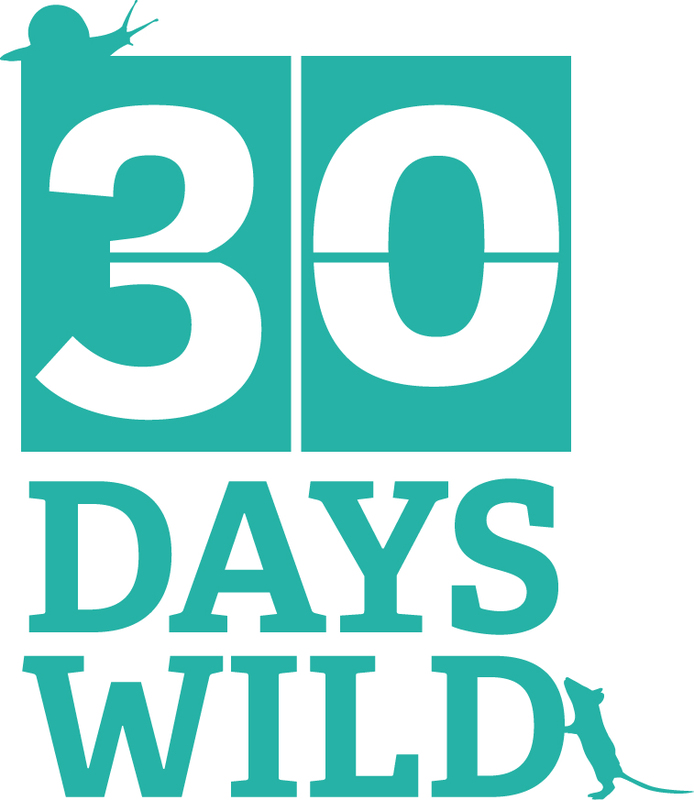 30 Days Wild – Day 17 – Blue is the Colour! 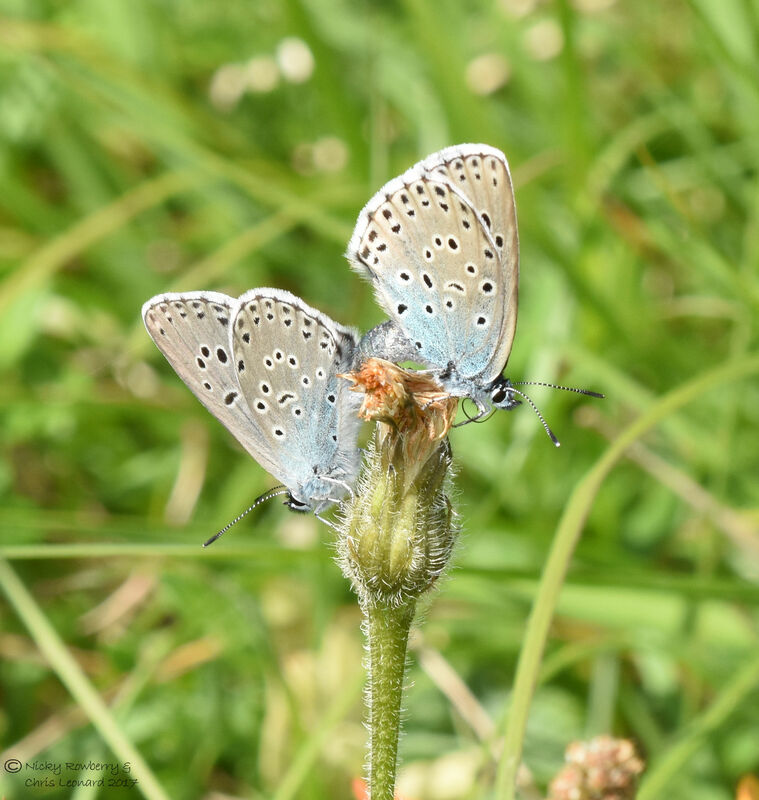 It’s Day 17 of 30 Days Wild and with blue skies above we went in search of the Large Blue Butterfly. 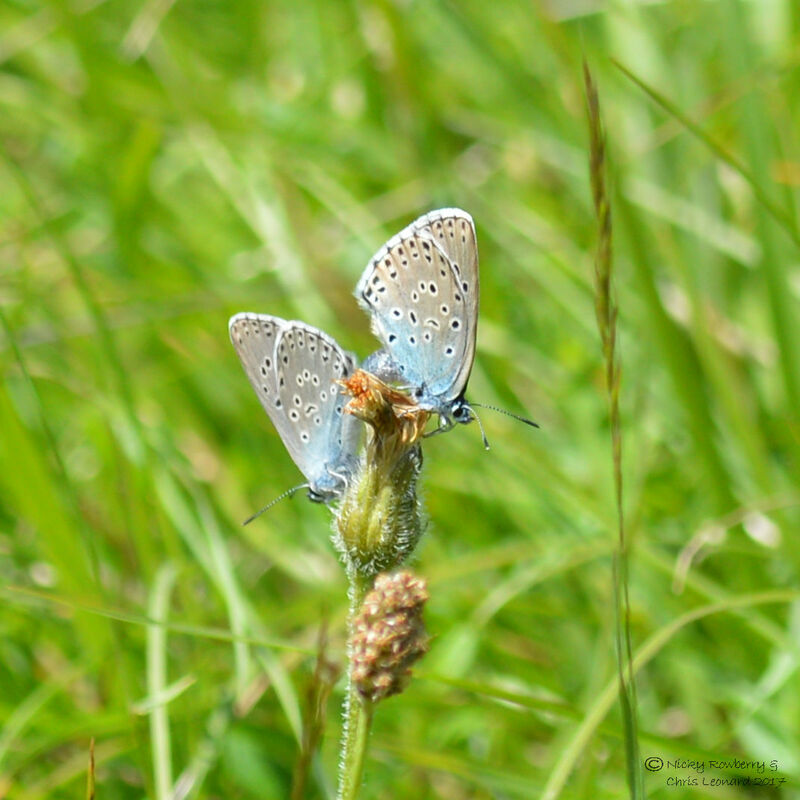 The Large Blue is probably Britain’s rarest butterfly. It actually went extinct here in the 1970s, but thanks to great efforts by conservation bodies, it was reintroduced to a few sites in 1984. One of these sites is Daneway Banks in Gloucestershire and that’s where we headed today. Butterfly Conservation’s Gloucestershire Branch had an organised walk on and very kindly let us tag along. Large Blues have a really intriguing life cycle. 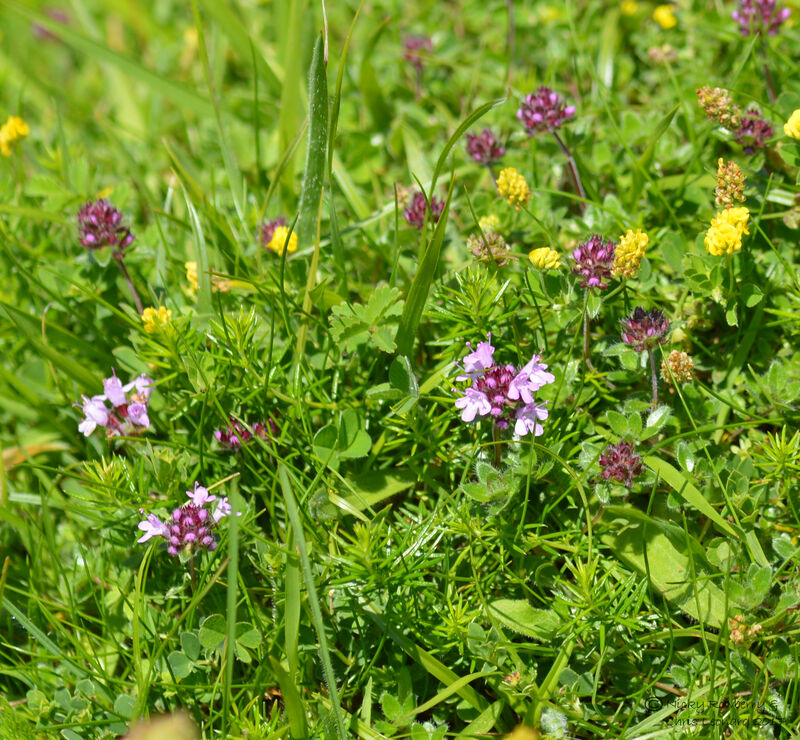 The eggs are laid on wild thyme or marjoram. The tiny caterpillars hatch and secret a substance that attracts a particular species of red ant. The ants carry them to their nests, where the caterpillars feed on the ant grubs. Eventually the new adults emerge and have to crawl out of the ants’ nests before they can open their wings! 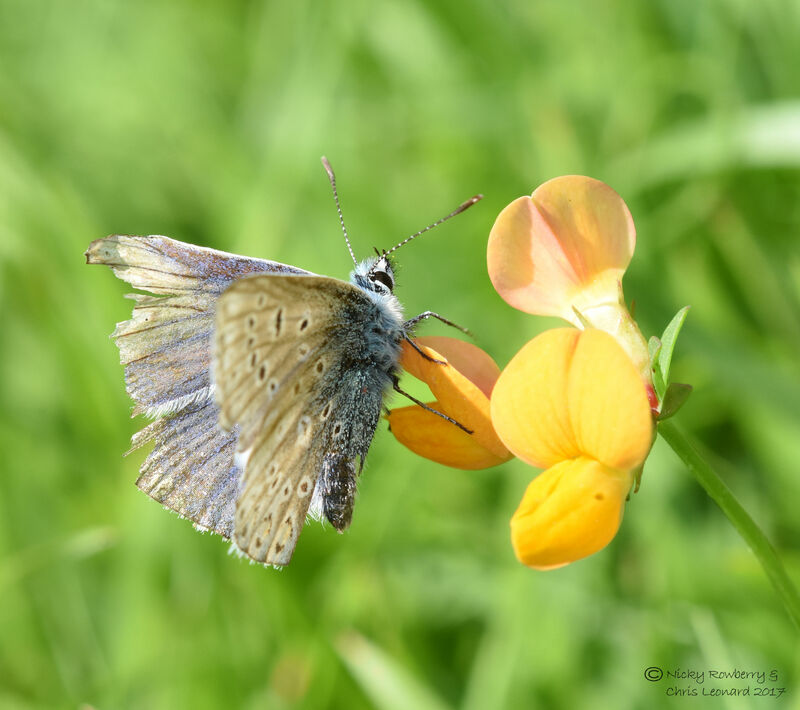 Daneway Banks consists of limestone grassland that is carefully managed by the Wildlife Trusts, to support the Large Blue butterfly, which of course has the side effect of supporting lots of other wildlife too. It is up a steep bank and looked stunning today in the sunshine, with wildflowers and butterflies galore! 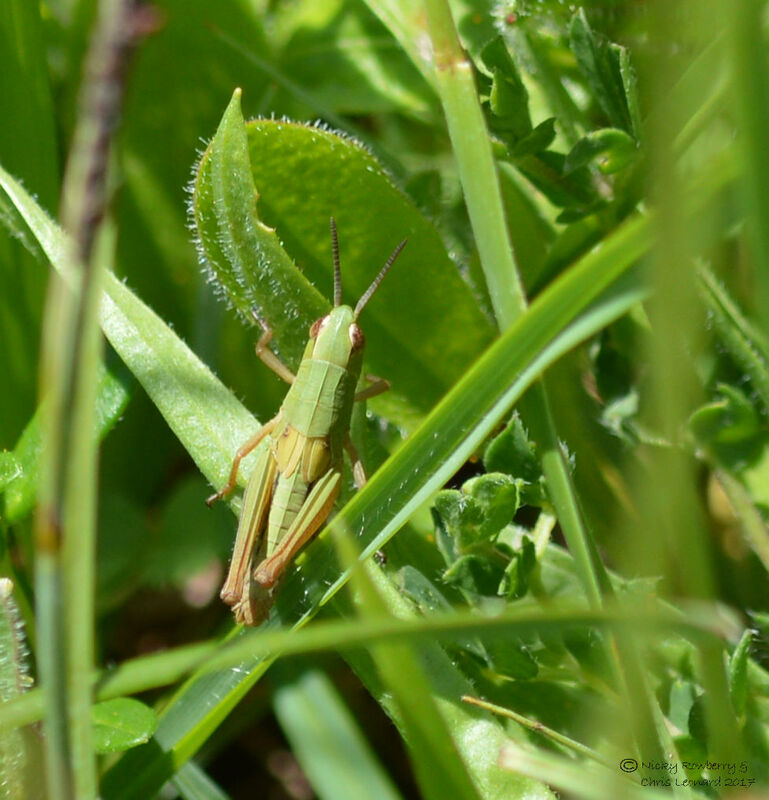 Apart from the chatter of excited would-be Large Blue spotters, the predominant sound for me was the chirruping of grasshoppers. There must be hundreds there judging by the noise, which I love – it is one of the true sounds of summer for me. So two whole posses of us set off in search of the Large Blue. There is quite a camaraderie about going out with a bunch of people all interested in seeing the same thing! 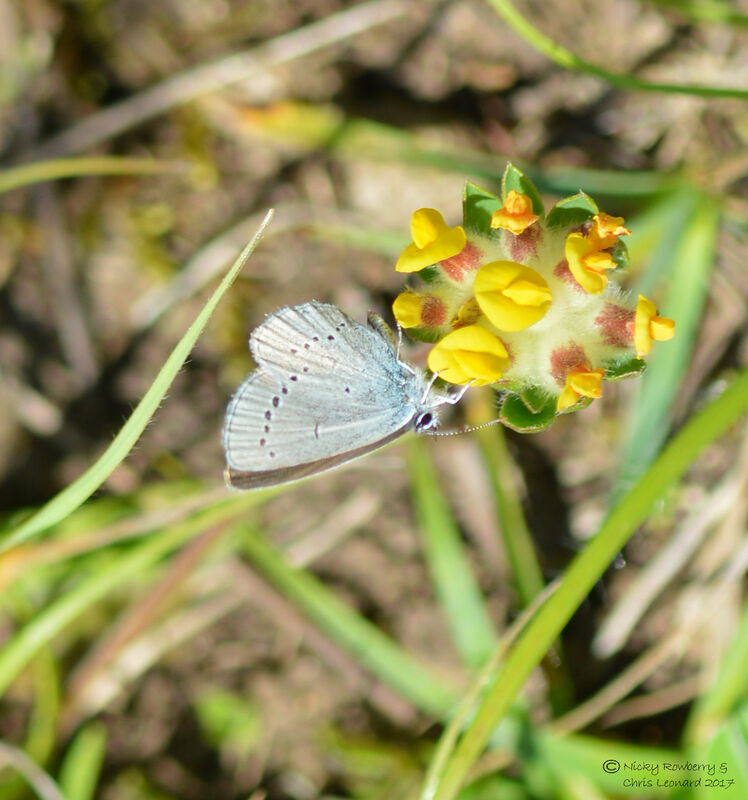 Over the day we saw about 13 species in total, but initially the Large Blue remained elusive. But there were other blues to tempt our fancy. There were several Common Blues, including this particularly tatty one. Small Blues were also reasonably common, although very difficult to get a decent shot of. While we searched for our elusive target we saw plenty of beautiful orchids, which at least don’t fly off! 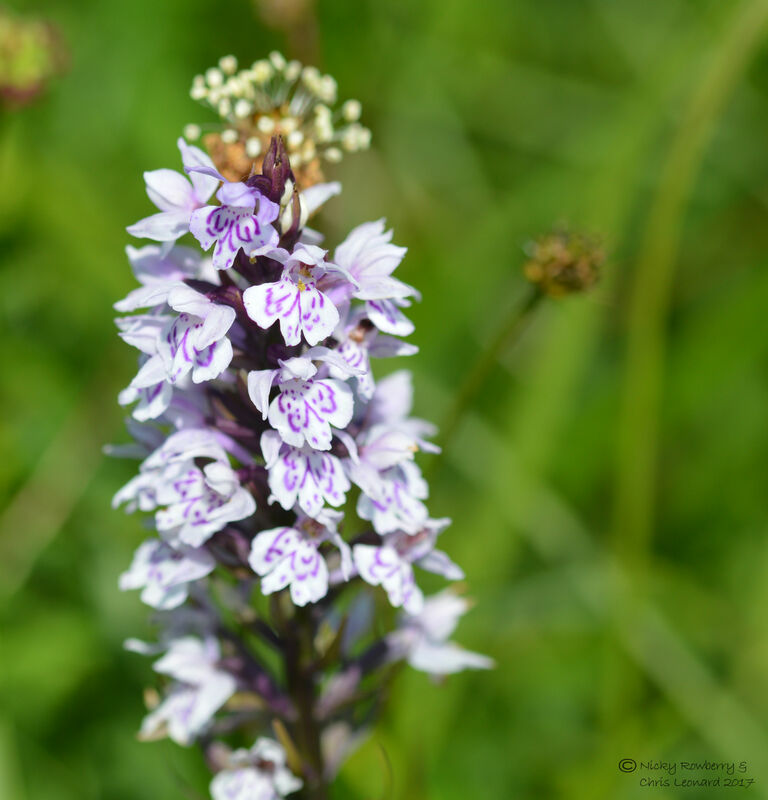 Most were these ones (possibly Common Spotted Orchids). 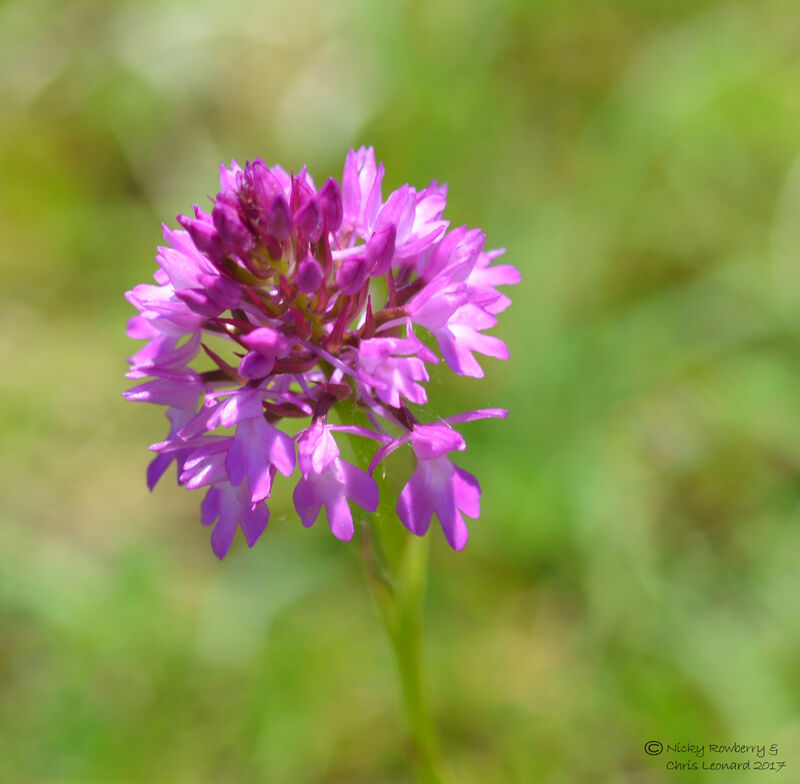 There were a few of these pretty purple ones, which I think may be Pyramidal Orchids? 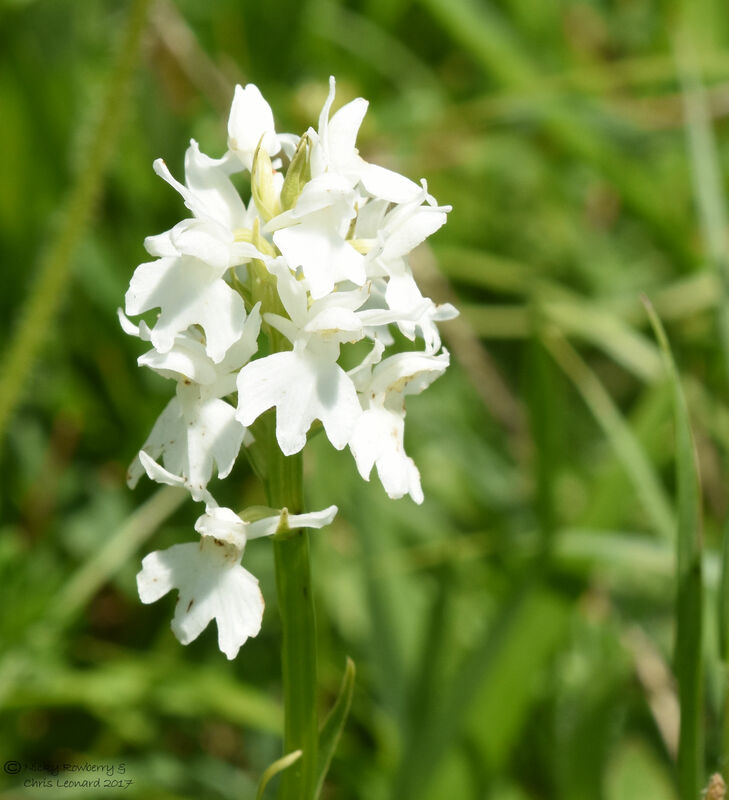 We spotted this one perfect white one – not sure if it was a different species or just a colour variant. 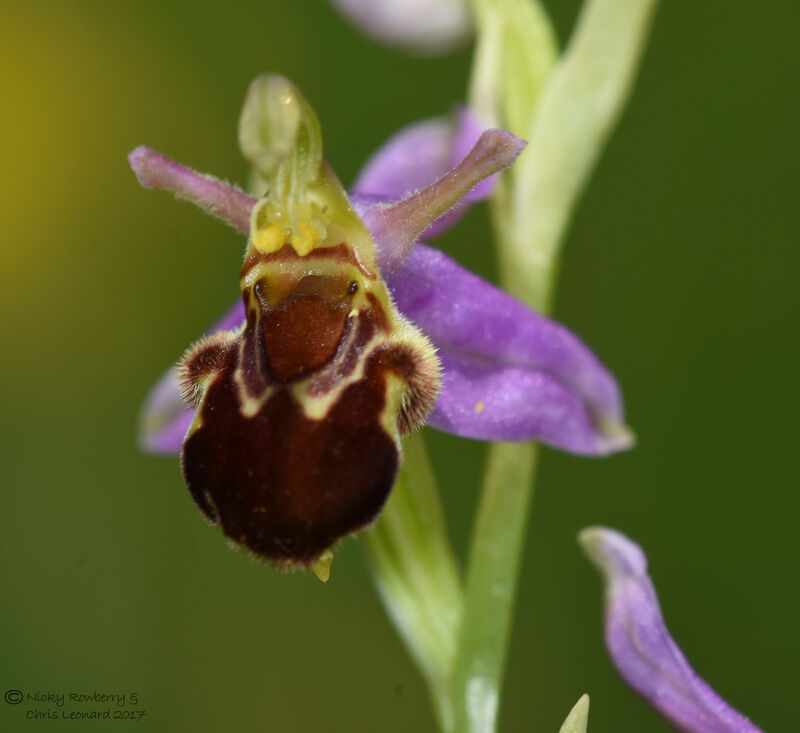 Prize of the day went to this Bee Orchid though – absolutely gorgeous and unlike any we’d seen before. 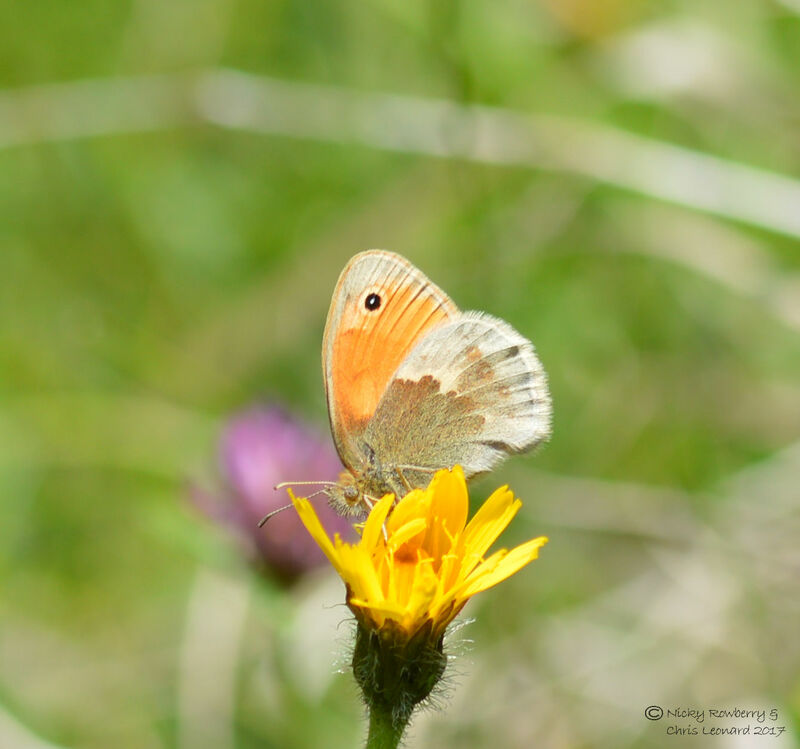 But back to the butterflies – Meadow Browns & Marbled Whites were present in abundance, but none would pose for a photo. 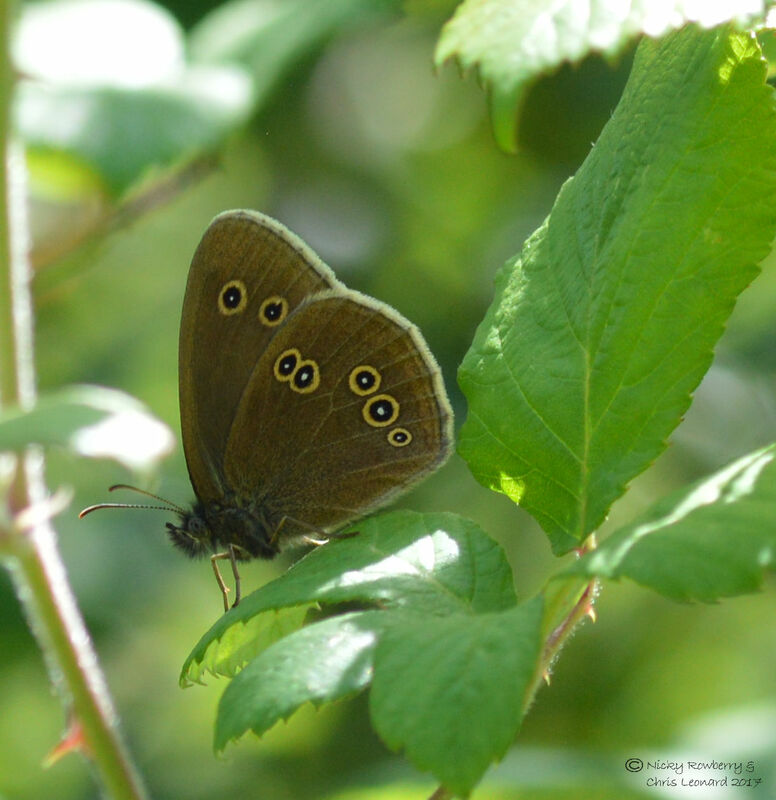 This Ringlet and Small Heath were more agreeable to it, although still a bit flighty. Chris and I eventually spotted a blue butterfly that looked larger than the rest. It flew off towards another enthusiast who was much more knowledgeable than us and confirmed it was indeed a Large Blue. All three of us set off after it, joined by others as we hurried, only to lose it over a grassy bank. 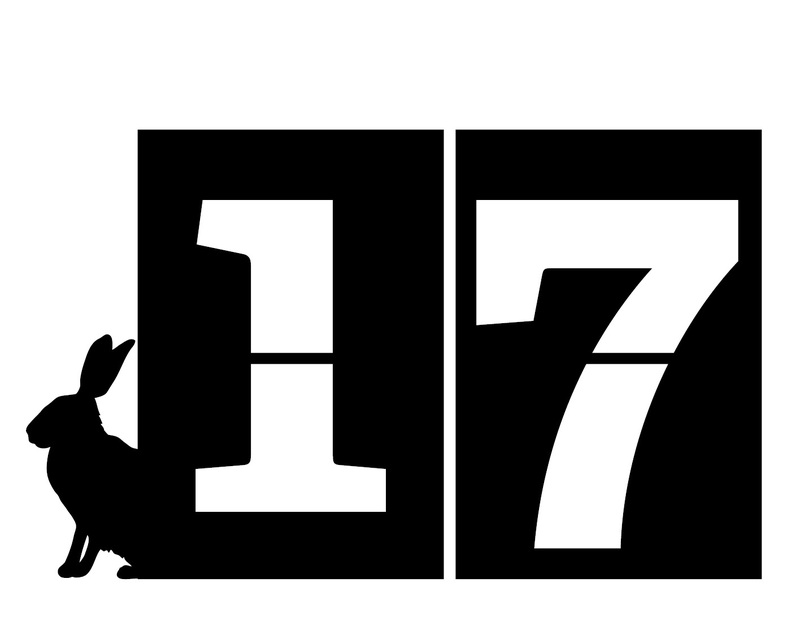 But at least we’d seen one, so that was progress! Eventually we saw Andy – the group leader – waving us over. 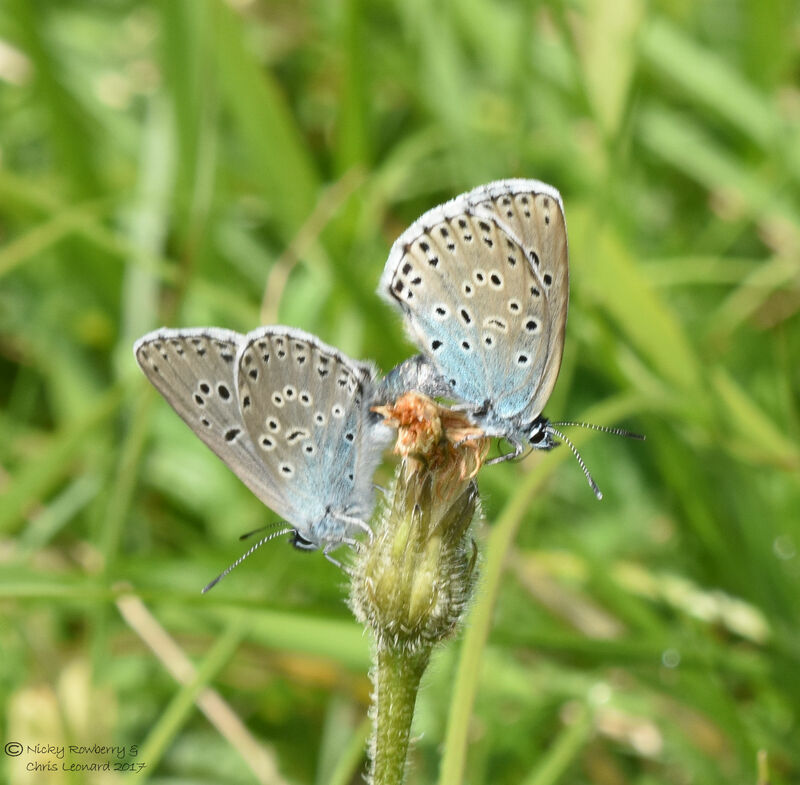 Unbelievably a mating pair of Large Blues had been found! Chris and I hurried over to join the excited throng. None of us wanted to get too close to disturb the loved up pair, but we did manage to take some photos at least. So here are our Large Blues. We saw a couple more Large Blues over the next hour, but despite our spirited pursuits, none stopped long enough to be photographed. So unfortunately we never got a shot of one with its wings open – perhaps that’s something for next time. 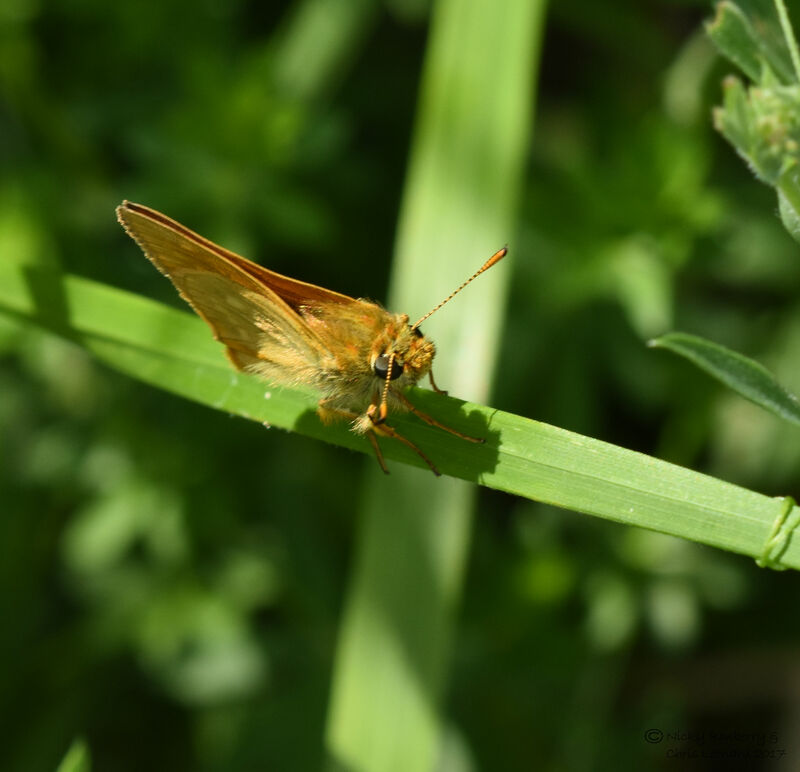 As we headed back towards the entrance though, Chris managed to grab a shot of one of the Large Skippers we’d been seeing all morning. 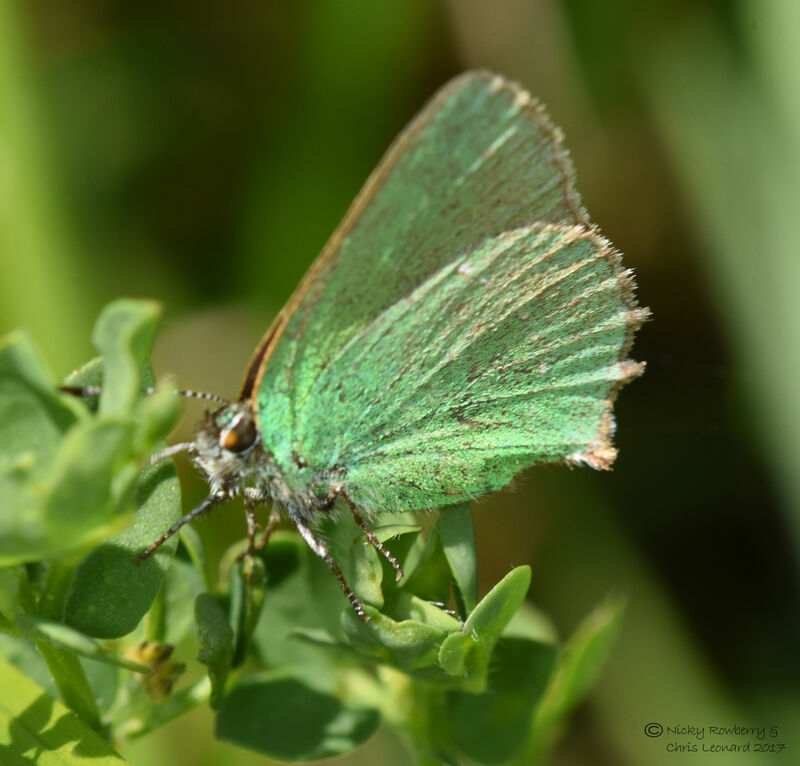 But the final surprise came right near the end – Chris spotted a Green Hairstreak! I didn’t believe him at first, but sure enough there it was – a very definitely green butterfly. I’d say seeing the Green Hairstreak was the perfect end to the trip, but actually the cold drink in the very nice pub (Daneway Inn), finished off a boiling hot day just perfectly too. So we’ve bagged our 42nd species of butterfly and one of the most interesting ones to boot! 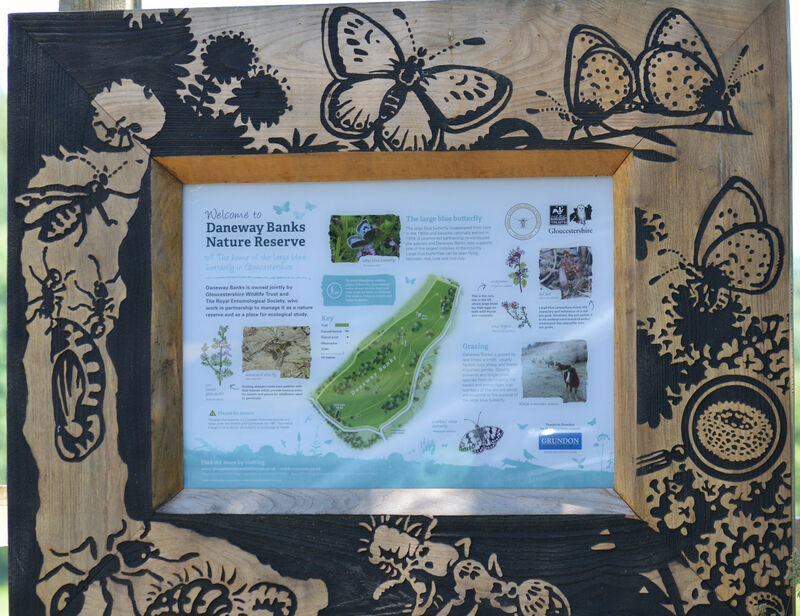 Huge thanks to Butterfly Conservation Gloucestershire for letting us midlanders tag along. 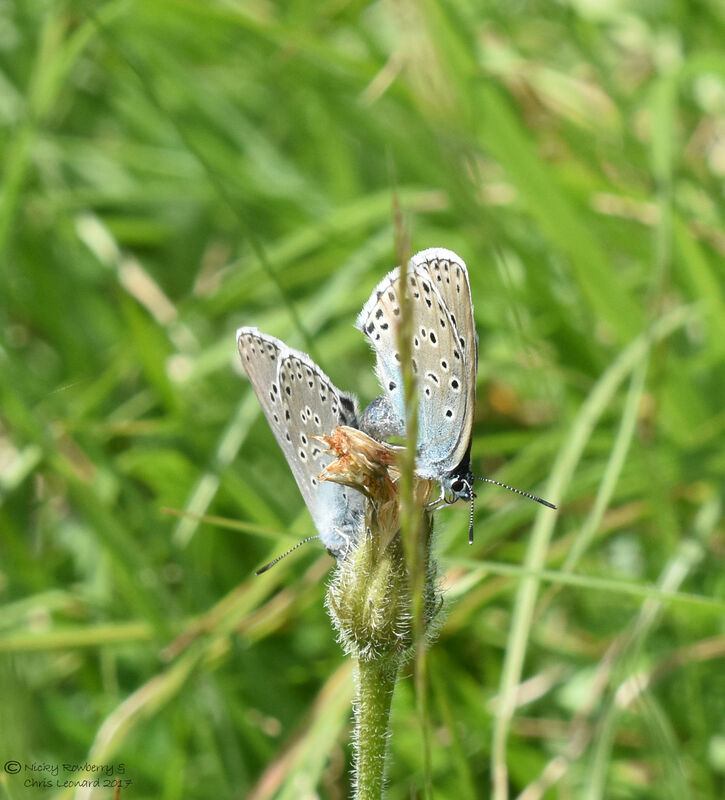 I hadn’t really dared hope that we’d ever see a Large Blue, but to see a mating pair is simply amazing. Fingers crossed it was a successful union and that Daneway Banks is blessed with many more generations of blues to come! Lovely photos! That green hairstreak is gorgeous.